Today’s ultra modern diesel pickups do not roll coal. It requires a custom setup to make this happen. BB Diesel Performance does not condone rolling coal for the hell of it, on some poor hybrid driver, on pedestrians, bicyclists, etc. We do not like to see it done out of spite for “Tree Hugging” environmentalist and good citizen Americans. These are the very same people who recycle zealously down to the “toilet paper cardboard”. They will potect our environment for future generations and I respect them for that. Our children deserve the breathing of clean air and coexisting in a world free from serious pollution. We operate our business in an environmentally conscious manner and want our clients to enjoy the benefits of a custom diesel performance tune. 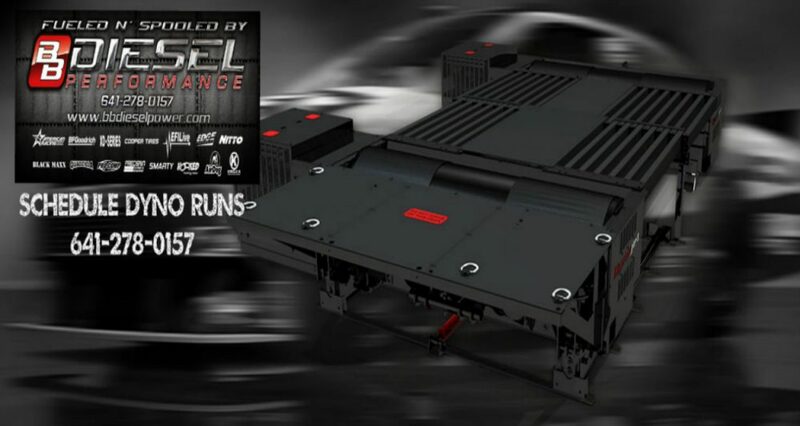 This is designed to boost horsepower and torque output without polluting the air. Removal of EPA required emission devices is strictly prohibited by law and applies to off road use only. If you operate your vehicle on a public roadway, we are required to follow EPA guidelines. We operate highly modified Sled Pulling Trucks during the truck sled pulling season and roll coal on every single pull. This is expected as our trucks are setup to deliver more fuel than you would normally see for street use. Yes, it’s amazing to see our diesel machines rolling coal responsibly! 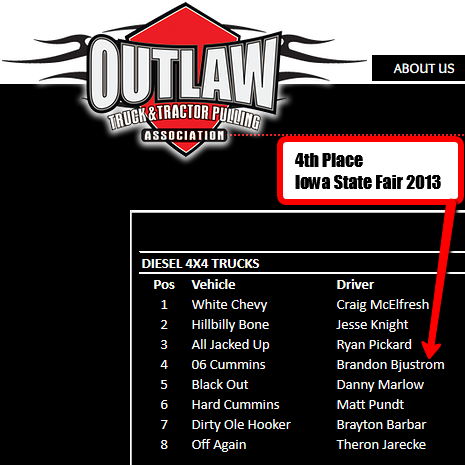 BB Diesel Performance competed in the 2013 Iowa State Fair Truck Pulling competition. Driver Brandon Bjustrom ended up in the money with a 4th Place finish. The Outlaw Truck and Tractor Pulling Association is a premier pulling organization located in the heart of the Midwest. Since 1982 Outlaw Truck and Tractor Pulling Association has worked towards one goal: to provide the best in Motorsports competition to you, the greatest fans in the world. We emphasize safety and fair competition as as our top priority. Outlaw has grown from 8 events and 40 members to 34 events and hundreds of members. With events from Texas to South Dakota and everywhere in between, the Outlaws are coming to an event near you.